Conserving and enhancing native biodiversity on farms brings many benefits as well as providing many challenges. 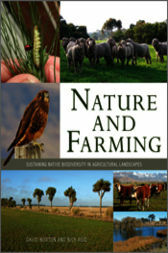 Nature and Farming explains why it is important to sustain native plants and animals in agricultural landscapes, and outlines the key issues in developing and implementing practical approaches to safeguarding native biodiversity in rural areas.The book considers the range of ecological and agricultural issues that determine what native biodiversity occurs in farmland and how it can be secured. Many inspiring case studies are presented where innovative approaches towards integrating biodiversity and farm management have been successful, resulting in win–win outcomes for both nature and society. In the integration and synthesis of these case studies lies the kernel of a new paradigm for nature conservation on farms. Although the book focuses on biodiversity conservation on Australian and New Zealand farms, the issues and approaches discussed are applicable to many other developed countries, especially in Europe and North America.